I am so impressed with how quick and witty the right was in responding to and debunking Obama's latest campaign prop "Julia." Along with getting #Julia trending with mocking tweets, at least two Twitter parody accounts (@WarOnJulia and @LifeOfJuIia) were created, and at least one Tumblr. 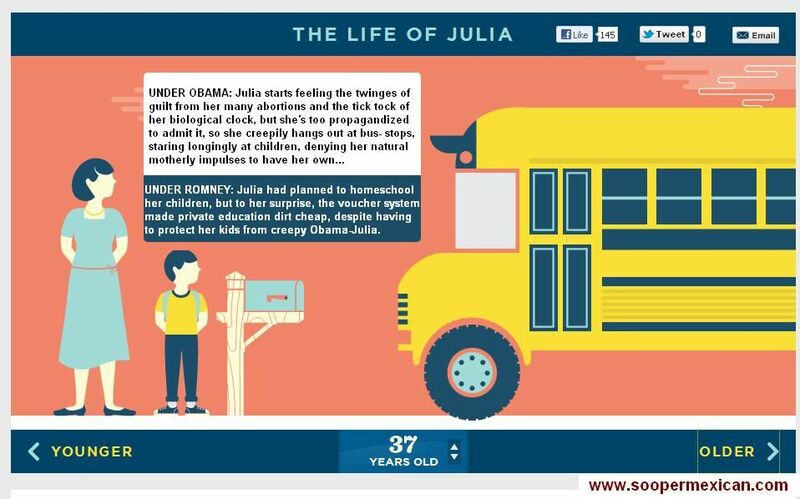 At age three, Julia enters HeadStart, which was actually launched, not in Barack Obama’s presidency, but in 1964, and is, as you’d expect, basically the DMV of day care. According to a 1998 study, HeadStart seemed to actually disadvantage children, and in 2004, Congress had to expand enrollment in the program because – and this is key – poor people didn’t want it anymore basically because it sucked. Under Barack Obama, spending dramatically increased for HeadStart, but as the New York Times pointed out, he didn’t require any changes to the program, so right now, it costs taxpayers around $22,000 per child that its not really helping. A comparable private day care would only cost the American taxpayer $9,500. With conservative reforms: Julia will be a happy three year old unburdened by the federal government. She will not be $50,0000 in debt the day she is born, and her parents will have access to private preschool providers of choice. Apparently, nothing happens in Julia’s life until she’s 17. There’s a reason for that – America’s public school system is an utter failure, and Obama knows it. But Obama says that Julia at age 17 is flourishing (presumably she isn’t one of the approximately 25 percent of all students who drop out of school, or one of the 40 percent of black or Hispanic students who do so). 22 years: After working in the bar for a while, Julia decides she likes it and wants to open her own place. But she’ll need capital to get that done. Under Obama, there is little or no credit available to small entrepreneurs, because we never got around to fixing the problems in the banking system, instead choosing to futz around with things like the disclosures on credit-card offers and micromanaging swipe fees and grandstanding about bonuses. Julia does not open her new business, and she doesn’t hire any other Julias to build, decorate, supply, or staff it. Julia finally has a job…but has to quit because of the high commuting costs. Under Obama (who has been President for 11 years so far) gas is now 27 dollars a gallon. Because the country is approacing insolvency everyone who makes more than $40,000/year has to pay 80% of their income in taxes (and it’s not helping). On the bright side, she still has health coverage (although thepremiums have skyrocketed)and still gets free condoms. This is Julia at age 37 - which means if Julia is 3 years old today, it's the year 2046. If Barack Obama's budget is followed, the economy will have long ago collapsed under the weight of debt and deficit brought on by out of control entitlement spending. But Obama is going to go on pretending that these programs are just fine, and both the American economy and Julia are doing fine in 2046. ...Julia must be living in a kind of alternate reality where, after President Obama leaves office, a serious budget reformer comes in with significant entitlement reforms that get debt and deficit under control. That would be the only assumption possible considering Julia's relatively normal life at age 37. Age 65 – It’s 2077, and publicly held debt is now 180 percent of the GDP. But Julia will still be covered by Medicare “as we know it,” at least if President Obama was reelected in 2012. That’s right, no Medicare reform for the next half-century, according to Obama. 65 years old – My, how time flies! (Do women do nothing of value between 42 and 65?) Julia enrolls in Medicare, which ceased to exist decades earlier, thanks to the fact that Obama and Tim Geithner didn’t have a plan to address the debt crisis — all they knew was they didn’t like anyone else’s plan. Under Government Care: Social Security isn't nearly enough money for Julia to live off of; in fact, it's bankrupt. Julia starts gardening and painting fences to make ends meet. Her degenerative arthritis makes life very painful, but a government health care panel has ruled that knee replacement surgery is medically unnecessary. Her son Zach is unable to help with medical costs because he has been unable to hold a steady job due to the poor economy his mother's generation left him. Thanks for the compendium. With any luck and this much ridicule, Julia will be retired sooner than the WH planned. This blog was better than iowahawks for the simple fact it wasn't full of anti-mormon fear-mongering lies. I may not like Romney, but I'd rather have him over Obama. It was simlpy CREEPY to put that out. Julia's miserbale cradle-o-grave existence! FYI, I interpretted iowahawks' alleged "anti-Mormon lies" as sarcasm. He was really lampooning the Dems' over-the-top anti-Mormonism.